Has anyone else had issues with the automatic lens cover on the HV30? We've had ours go out for the second time this past weekend. It was repaired earlier about a month ago, only to fail again just this weekend. Upon turning on there is a slight grinding noise and the cover doesn't open. Needless to say it's not giving us warm and fuzzy feelings about the overall robustness of the camera. I personally haven't had it happen in the short month I've had the camera, but it is made of not as durable as you think plastic, I suggest even if the lens cap is closed that you put a UV filter to protect the lens and it's cover since they're much more durable. I just had a lens cover failure today on one of our HV30s. It's going to be inspected as a warranty repair, but as it is used in a school I had to reassure the vendor that it had not been dropped or abused. It was in use yesterday and seemed fine, though I didn't inspect it particularly carefully when I put it away in its case. This morning the cover wouldn't open fully when it was switched on. It buzzes but doesn't move when switched on. I've had an HV30 for about 2 months now and haven't had this happen. Upon hearing this I sure wish it had a manual lens cap. If this happens to me at a wedding I'm not going to be happy. Just as a follow up. Service fixed it (again). Claimed in the repair letter that it was "dust" and not covered, but that they would waive the fee as a courtesy. The camera is kept in a bag between usage and was just "repaired" for the same thing less than two months ago. If it's that sensitive I'd be surprised. I suspect the prior repair was not complete, or that it was a generic warning. But, make sure you keep the business end very clean folks! We got ours back yesterday - a free repair, not sure if it was by the vendor or was sent back to Canon. It was away for about 3 weeks. As it will probably have a W/A adaptor on it most of the time now (just acquired a WD-H43) it will be interesting to see if the automatic lens cover goes again now that it is hidden away from contact with anything. My lens cover had this problem and would make a series of clicking noises that would also delay the camera from starting up for a few seconds. I pushed the shutter fully open by hand and lived with it for a while. But today I decided to strip the camera down and take the front section with lens cover mechanism apart. There is a lot a screws and I probably took it apart more than needed. Once the front section is removed I took a few pics to remind my self where things went. The shutter assembly is very simple. It works with a small electric motor driving a worm gear and that gear connects to a rack type gear on a sprung plate this pushes each aperture leaf of the cover. I noticed a few grains of sand/dirt around the gears and just one single grain on the main gear preventing it from turning, this was the cause of the failure. I used bellows and a soft brush to clean the area and then put it all back together. All is now working great. You could put a filter thread to another size on the front then a standard off the self lens cover for extra protection. If the lens cover fails to open or close and or makes that clicking noise it's dirt. You could use compressed air to try and dislodge the dirt but as there is a tiny amount off grease on the tiny gears it may be tricky to remove. Total time was about an hour. 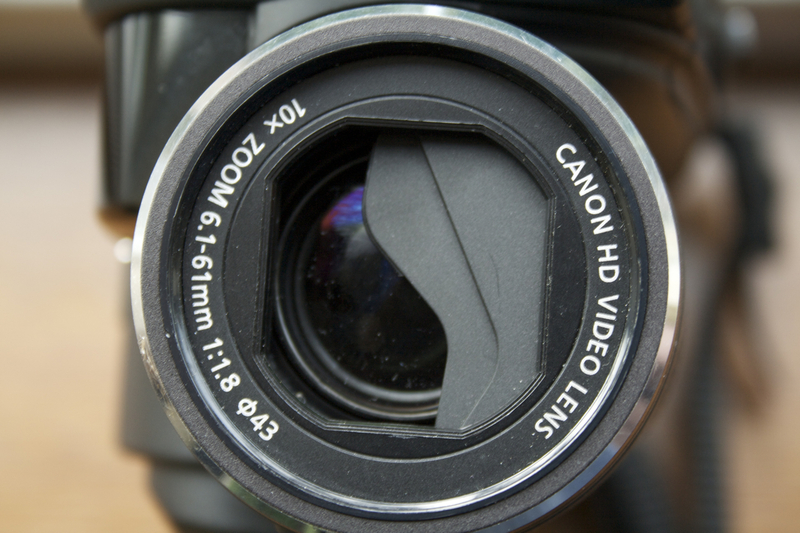 Had another (temporary) problem with an HV-30 lens cover recently, but it went away after cleaning and massage. Probably caused by grit and looked much the same as the photo posted earlier, but it's working fine again for now. I was more concerned about it not opening fully than about it not closing on one side. As Jack wisely stated, a $15 UV filter will be your first line of defense against dust/probing fingers, undue pressure or whatever else caused the failure. My HV30 isn't exactly 'babied', but it's been going almost 1 year without trouble of any kind. Fitting a filter is a good idea, but my HV30s are used several hours most days at the moment so my "flying hours" are probably above average. I often use them with a W/A converter attached so that is probably equivalent to having a filter attached. Yes, that's a problem with the HV30. Interestingly, I never had these problems with HV20's. I have a workaround. Take a tiny strip of black duct tape and delicately tape open lens cover. It will hold just be careful to NOT duct tape the lens. You can then screw a wide angle or lens filter onto it, even over the duct tape, to protect the lens since it will always be open. Buy a cap for the lens filter. Note every time you turn on camera it will click like hell. Not pretty but it works. I think it's a reliable cam otherwise. Mine have survived some pretty impressive drops and crashes. I just turned in my HV20 to Canon service for the same problem. It had a wide angle adapter on it for most of the usage. I removed the adapter and the same day the cover failed. I tried using my 5DMKII for b-roll and family video but the post work involved was not as simple my HV20 content. I hope I get it back soon. I also hope they don't charge an are and a leg. I wonder if the other Canon consumer models have the same design of lens cover? Just looked up the manual for the HF20/HF200 and it seems to be quite similar. And I imagine the new models wiil have it as well. Have there been any problems with the HF20/HF200 etc lens covers? I'm curious if this has popped up with the HV40 - or have they improved the design? I've bought three HV40s for a documentary that will be shot later this year in less than desirable conditions. So far I've only shot a few test tapes with no issues and I am generally very impressed with the camera, but I'm trying to anticipate potential problems (you'll see in another post my concerns about tape transport as well). James: Since you've taken the front apart, do you think it possible to remove the shutter completely? I can use a screwdriver, have no problem with using traditional lens caps and am not worried about the warranty.